All transactions are safe and secure with a reliable history in online purchasing behind each of our associates. Buy the Sesame Street Graffiti t-shirt to own Sesame Street clothing and merchandise. Sometimes friends are hard to come by but not for Big Bird. He is one of the lucky ones. These classic Sesame Street tees feature some of his closest friends, including Bert, Grover, Elmo, Cookie Monster and Oscar the Grouch. Grab these Graffiti Sesame Street t-shirts to show that friends will always be around when you need them, even in the darkest of times. 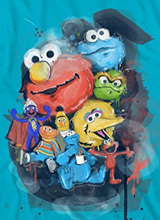 In addition to the Sesame Street Graffiti tee above, browse the Sesame Street Clothing Gallery for more apparel like men's and women's clothes, kids shirts or hoodies.